The Devil Campers Family HiTop 3+2 Campervan is one of our most popular vehicles - and it’s easy to see why. Automatic transmission, creative design and clever use of space means two adults and two small children can travel and live in total comfort. The driving cabin has seating for three with a radio/cassette. The two rear forward facing seats have lap/diagonal seat belts and child seat restraints can be easily fitted. The extra vertical space in the living area creates an airy, spacious feeling and ease of movement - and a good-sized double bed and roomy loft bed makes for comfortable sleeping. 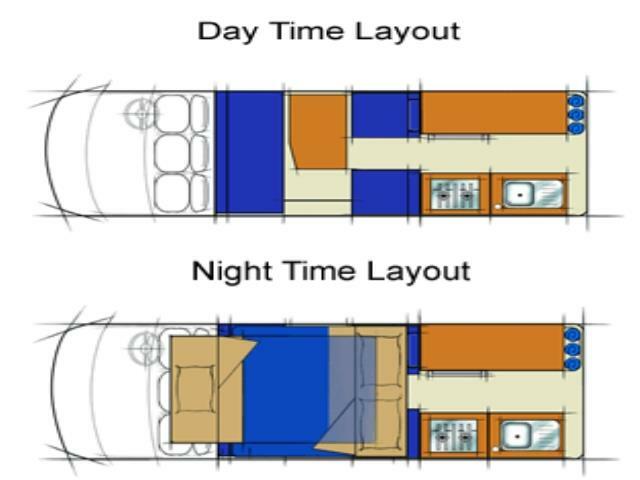 The optional awning package includes a side shade and a rear awning that can accommodate two camp beds or use as an extra room for living space. 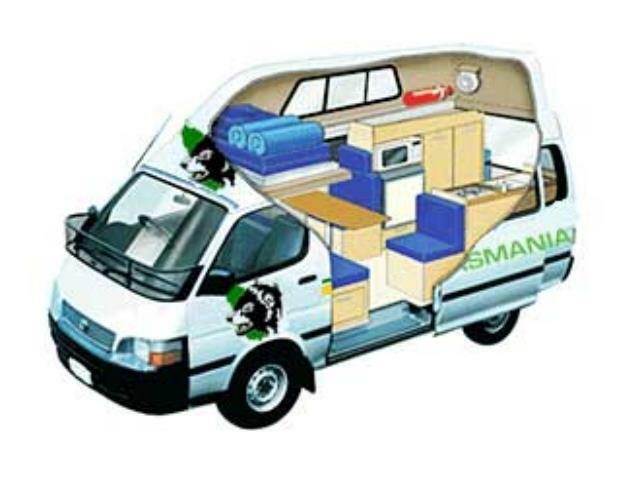 The ideal camping adventure for Mum Dad and the kids and there is no other Campervan like it in New Zealand. Every drawer and cupboard reveals a surprise - fridge, stove, wardrobe, crockery, cutlery, linen, towels and much more. With the Family 3+2 Campervan you not only get the freedom and comfort to travel where you wish, you can also enjoy the economy and ease of an engine running on unleaded petrol with automatic transmission. Include the Family pack containing a side shade and full rear awning plus table and chairs and you have everything you need to make your Tasmania Family Adventure holiday a reality. Engine : 2.4 litre, petrol. 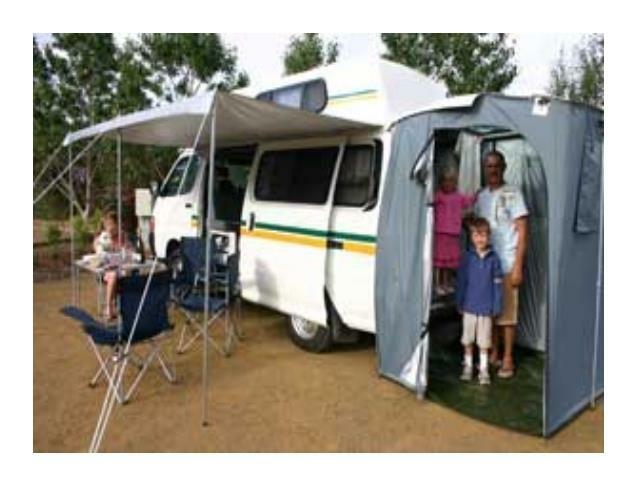 *Rear awning kit can accommodate two camp beds providing sleeping for five. Heating : Rear cabin heating operates on 240V when plugged in at a camping ground only. 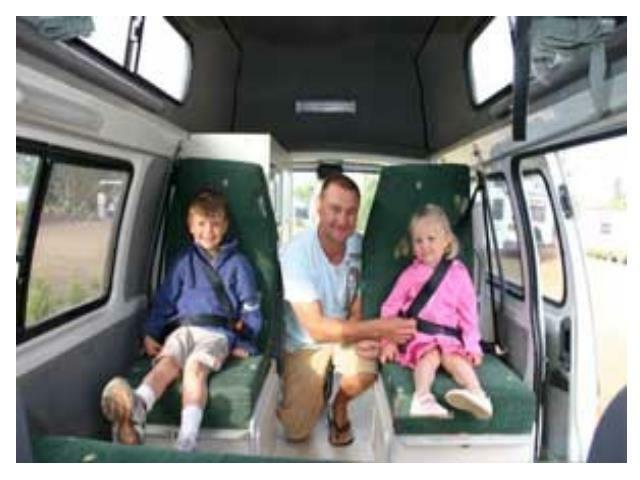 Child Seats : Baby seat can be fitted in the rear dining area with a diagonal seatbelt and tether clip. Please advise age and weight of the child upon booking. Water Tank : Capacity is 40 litre. It is recommended to fill this tank daily. Fly screen : Placed on upper cabin windows in living area. Seatbelts for three in the front driving cab plus two rear forward facing seats with seat belts and child restraint mountings. Kitchen : Gas Cooker: 2 ring cooker with griller ignited by match. Gas Bottle: A 4.5kg bottle. Fridge Freezer: The fridge operates on 12V battery whilst driving and on 240V mains when plugged in at a camp ground. The fridge will automatically switch over between the two supplies. Fridge capacity 55 litre. Storage : Ample cupboard space, storage under seats at rear of vehicle. Power Supply : 240V mains and 12V battery. The 240V mains power operates when the exterior power cable is plugged in at a camp ground. There are two 12V batteries, one for starting the engine and the other for domestic 12V system. This system includes water pump and fridge. Batteries are recharged by engine alternator. The house battery is also recharged from 240v mains power. Interior lights operate off 12V batteries and 240V. Exterior Access: Through side door, and rear door with step. Equipment provided: Crockery, cutlery, cooking utensils, pots, frypan, grater, chopping board, colander, potato peeler, salad/serving bowls, storage containers, toaster, kettle, teapot, coffee plunger, bucket, brush and shovel, sleeping bags or duvet, blankets, pillows, sheets, towels, teatowels, heater, electric jug, cloths pegs and line, fire extinguisher, LPG gas bottle, maps and camping ground guide book.